Classical and Greek Revival homes represent some of the earliest residences in central Indiana, having been common national architectural styles at the time of the founding of the state (1817) and its capital (Indianapolis in 1822). 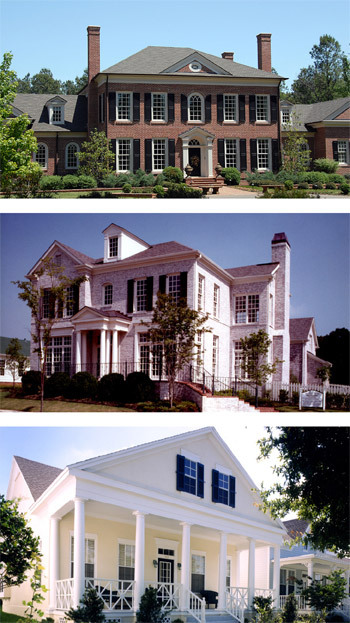 Similarities shared by both styles include houses which are typically dignified and formal with an ordered composition of simple, well proportioned volumes, often with one or two-story columned porches. Floor plans are customarily symmetrical. Windows are tall and elegant, eaves, cornices and door are beautifully detailed. 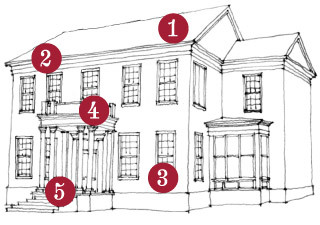 Distinguishing characteristics include doorways, cornice lines, and type of columns, with simpler detailing on Classical homes versus more elaborated Greek Revival. The Classical or Greek Revival house is usually clad in smooth bevel or lap siding, brick, or light sand finish stucco. Roofing may be architectural dimensioned shingles, slate or synthetic slate. 1. Simple, well proportioned rectangular massings. Gable commonly runs parallel with street unless in a 3 or 5-bay temple front. 2. Cornice and details mimic and reference historical detailing. 3. Openings are well proportioned and orderly in their relationship with one another, commonly seen in sets of 3 or 5. 4. One or two-story porches with full height columns; symmetrical side wings are possible. 5. Historically based and well detailed porches and columns in either the Tuscan or Doric orders. A. Roofing – Architectural dimension shingles, slate or synthetic slate, metal (narrow standing seam). B. Cladding – Smooth 4-inch to 6-inch exposure lap siding; brick; painted brick; light sand finish stucco. C. Columns – Tuscan, Doric, Ionic; Round or Square. D. Shutters – Sized to close over windows; panels or louvered, mounted with hardware to appear operable. E. Lintels – Light sand finish stucco, brick, pre-cast concrete, or trim. F. Railing – Straight or turned treated wood or composite material balusters; decorative black metal. G. Foundation – Brick or light sand finish stucco at main body; Masonry piers with screening or solid masonry veneer at porch.